This home is a prime example of luxury at its best. With high-end finishing throughout, including beautiful hardwood floors, tiled kitchen with granite countertops, 5-pc ensuite, aspen wood vaulted ceiling, and gorgeous mountain views. Enter the home through the spacious entrance covered by a large timber-frame veranda (12'x12'). Enjoy the open layout on the upper level with access to sundecks at both the front and back of the home. The master suite has a large walk-in closet and a beautiful private bathroom. On the lower level, there's a 1-bedroom guest suite with kitchen. There's plenty of room to use this space as a rental, in-law suite, or rec room.This home is a prime example of luxury at its best. 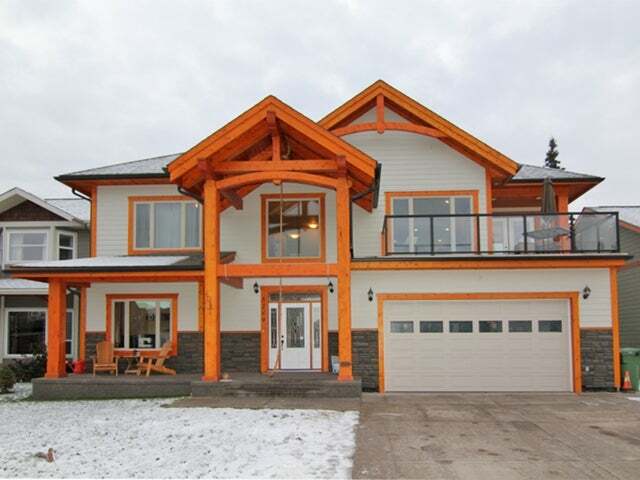 With high-end finishing throughout, including beautiful hardwood floors, tiled kitchen with granite countertops, 5-pc ensuite,aspen wood vaulted ceiling, and gorgeous mountain views. Enter the home through the spacious entrance covered by a large timber-frame veranda (12'x12'). Enjoy the openlayout on the upper level with access to sundecks at both the front and back of the home. The master suite has a large walk-in closet and a beautiful private bathroom. On thelower level, there's a 1-bedroom guest suite with kitchen. There's plenty of room to use this space as a rental, in-law suite, or rec room. Floor Area 2,844 Sq. Ft.